I am Nicoletta, an artist and art director. I live on Long Island with my husband and two young children. 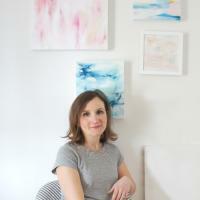 After working for several years as an art director in a large cosmetics brand in NYC, I now work from home doing what I love—painting portraits and abstract art pieces in both large and small scale. I find inspiration in my passions—the garden, the beach and most of all, my family.